The idea behind Squirreled is to collect as many acorns as you can before winter arrives. This sounds like a simple task, but it’s anything but. In order to play the game you have to tap on falling acorns in order to split them apart, revealing acorns with a smaller number. 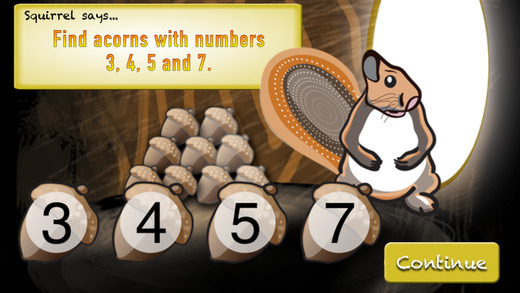 The number of times you tap an acorn determines the fraction at which it’s split. For example, if you see an acorn with the number 20 and you tap it once, it’ll break into two acorns with the number 10 on them. Players must collect acorns based on the round requirements, so it’s important to pay attention to the number of acorns you’ve accumulated while playing. If you collect all of your acorns before time runs out you can proceed to the next round. When it comes to gameplay I found that Squirreled was a bit tough to get used to because I didn’t quite understand the basics of the game at first. I was tempted to tap away like crazy thinking that I’d earn points for destroying acorns, but this definitely isn’t the case. Once you get the hang of the game, though, it becomes incredibly fun to play because you keep challenging yourself to beat the next level. I also like the fact that Squirreled switches things up for each level. For example, level 1 requires you to capture acorns falling from the top of the tree. Level 2 takes you to a back yard where you must collect acorns while dodging a lawnmower. I also really like the graphics and sound effects in Squirreled because they add to the gameplay experience. Don’t let the cuteness fool you, though, because this is a seriously challenging game. 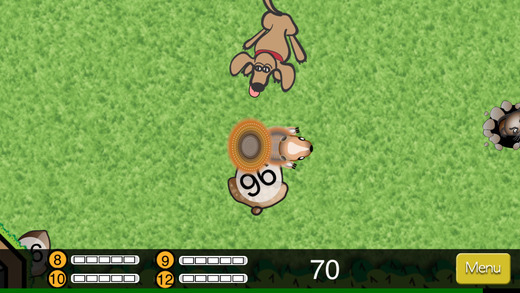 When it comes to being both a fun and educational game, Squirreled pulls it off. This is something that both kids and adults can play, enjoy, and actively learn from. Squirreled will make you think, but you’ll gradually learn to take your time and memorize numbers in order to attain the desired acorns and fill your quota. Overall, Squirreled is a must-have game for both kids and adults who either want to take advantage of their mental math skills or work on building stronger math skills while having fun. The game includes tons of content, as well, and the developer seems to be actively releasing new content regularly. I also want to mention that Squirreled is available to play on Apple Watch, as well, and features 3 levels with 150 rounds of gameplay. Squirreled requires iOS 6.0 or later and is compatible with iPhone, iPad, and iPod touch. This app is optimized for iPhone 5.